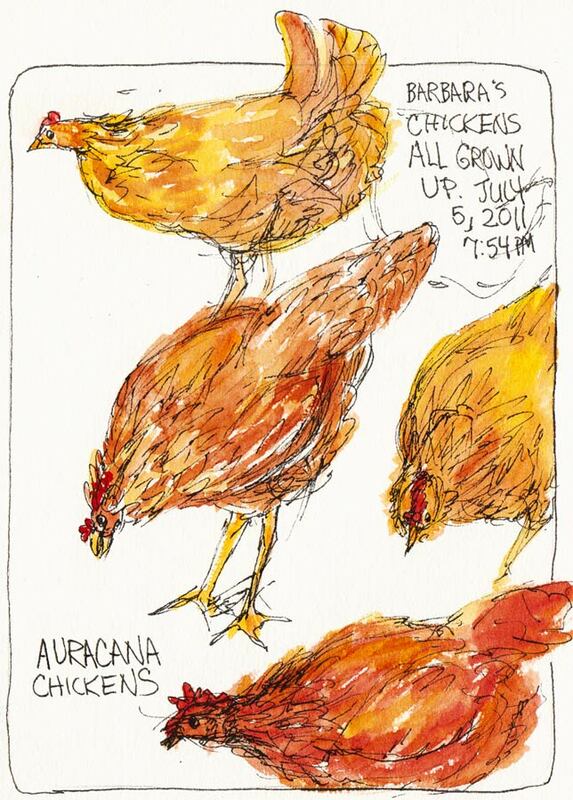 Barbara's Chickens All Grown Up, ink & watercolor 7x5"
The first time I got to sketch Barbara’s chickens they were these cute little chicks. Now they’re full-grown laying ladies and hilarious to watch as they run about with their tiny bird brains. Barbara has built the most amazing Chicken World for them in her yard, where they can run free and eat bugs and organic greens, safe from predators (raccoons are a big problem here), or snuggle in their cozy nesting house. The last time we sketched in her garden I sketched Gertie from the front. Here she is from the back. She is a wonderful, loving, and very furry pooch. 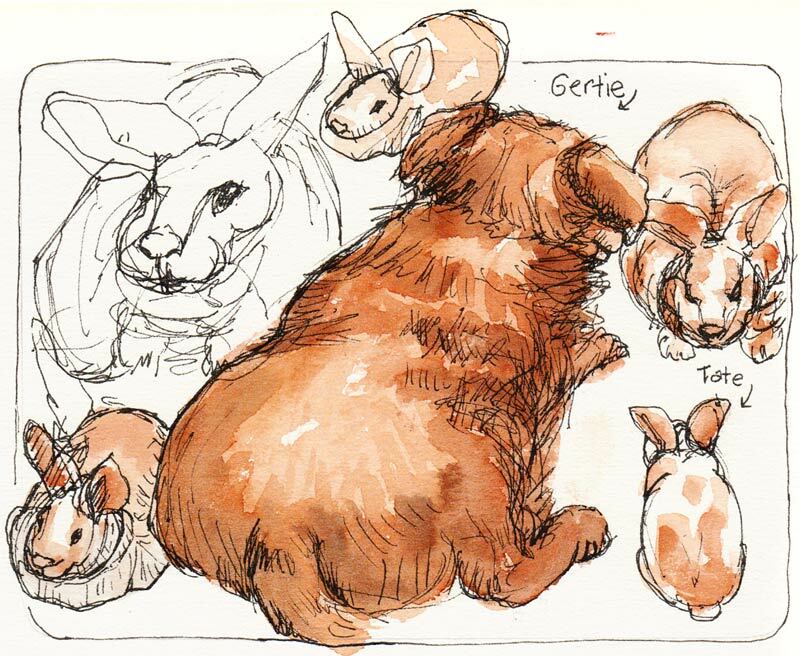 Then I started trying to sketch the bunny Barbara was babysitting for her daughter. The bunny was so twitchy, didn’t hold still and so fluffy as to be seemingly amorphous. But I knew there were some basic shapes in there somewhere so I kept trying to find them. 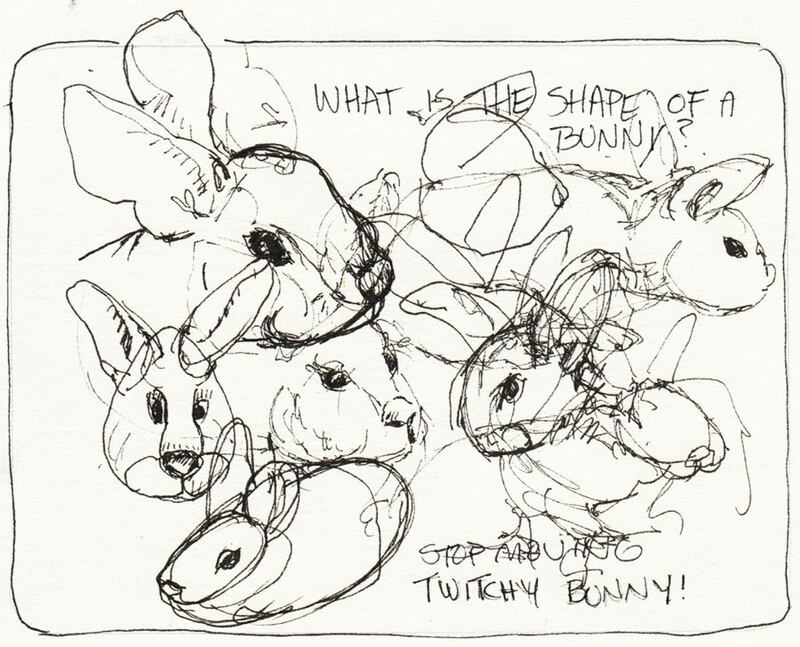 Above are the first attempts at the bunny, in which I became totally frustrated but didn’t give up. I’m glad I got to draw him since shortly after our sketch night he passed away from a recurrence of a serious illness he’d fought several times before. I hope he has found a home in bunny heaven as nice as the one he had with Barbara’s family. Next Post: Eight Dollar Eggs! Great sketches! We just raised some little fuzzy bird brains into full grown but not laying yet bird brains. Their bodies grew, but it’s hard to see if their brains are much bigger or more efficient. Fun to watch, though! I’m glad you got to sketch the bunny too. He’ll be missed I’m sure just as my little dog who just died from a rattlesnake bite. Your drawing of the dog here helps me to know how to draw mine from the photos I still have of her. And your bunny sketches look pretty good to me. Love your animals, esp. the bunny! Great sketches, and it is next to impossible to draw things that won’t hold still! Loved your little aside about “not so much” . That “meh” keeps appearing in people’s blogs, and I have never heard a person say it nor do I know it origins. Is it a bloggy fad? ?